Right now I'm all about that faux glow, Strobing, illuminating primers, powder highlighters, cream highlighters. You name it, I've pinned it. I might have got a little carried away and ordered one to many things over in America, so while I wait for my beauty products to arrive, I thought I would test a few products that you can get right here at home, at your closest Dis-chem or Clicks. I thought I would share with you all a simple way on how to achieve that glowy face. These few products I picked up really helped make my skin look alive and radiant. They are the perfect products for a light and natural look. 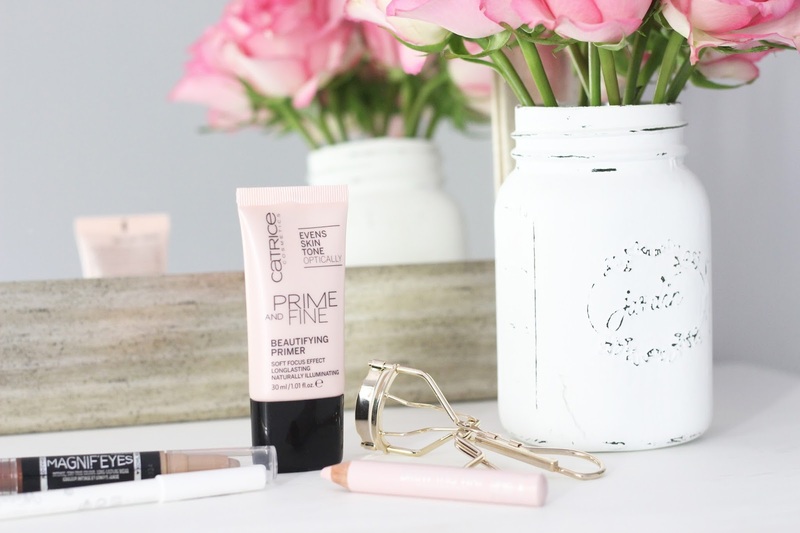 I start out by using Catrice's Prime & Fine Beautifying Primer, I had been looking for a good primer for quite some time when I thought I would test this one out. It's a light blush pink primer that contains vitamin E that hydrates the skin as well as light-reflecting pearl pigments. 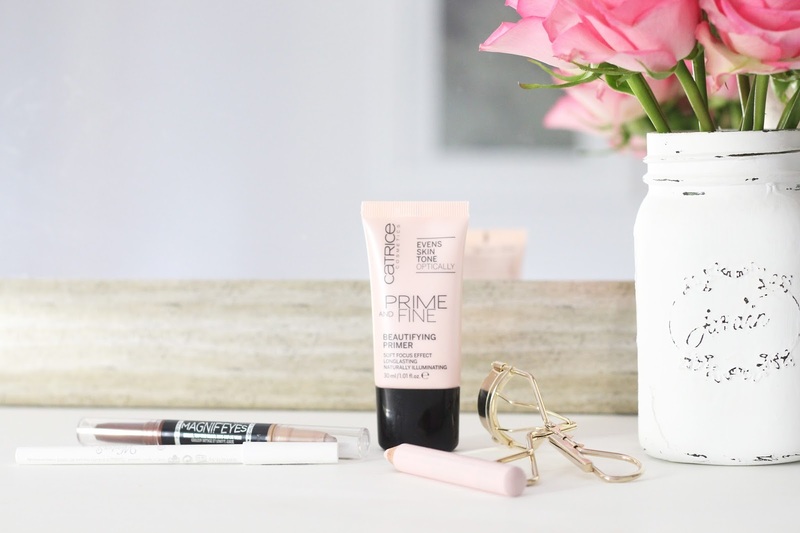 My skin had been looking quite dull and dry throughout the winter, but since using this primer, I have found that it gives my skin a lovely, healthy glow. It brightens the skin and preps it nicely for foundation. Don't worry about it being a pearly primer, it only gives the skin a healthy glow, it's nothing too shiny or dramatic. My skin just drinks this product in, I find it also extends the wear of my makeup. Overall it gives your skin that radiant glow that we all want without it looking overdone. 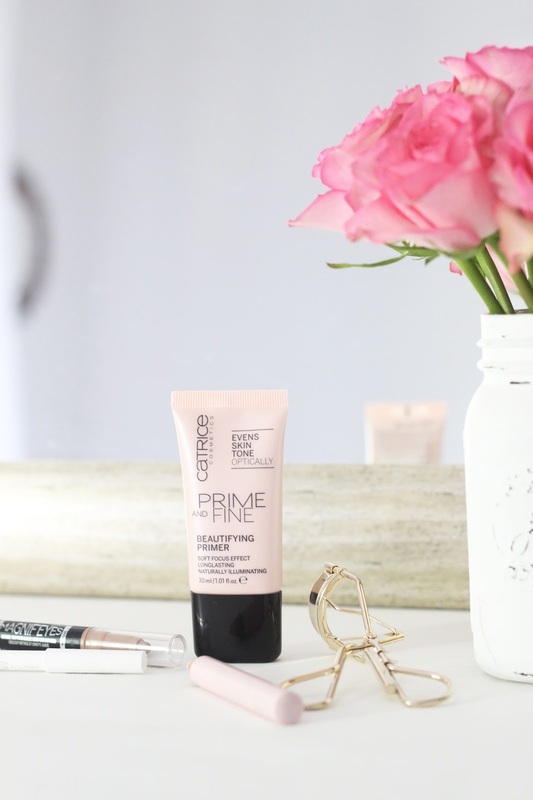 I use this primer almost every day and I absolutely love it. And the best part is it's super affordable. Another great little product is Magnif'eyes Double Ended Shadow + Liner by Rimmel. It's a double ended cream eyeshadow. I purchased the shade Queens Of A Bronzed Age. I love the copper and champagne shades. Only downside was that my liner side of the stick broke off, so sad! However I was still able to use it without any problems. The creamy texture is delightful and easy to apply, and very pigmented. I run the stick over my lids and then blend into the creases and corners of my eyes using my finger. Although it's a liner and eyeshadow stick I have only used them as shadows so far. The champagne shade is supposed to be the liner which I find a little odd as it is the lighter shade, however I bought this product with the intent to use them as eyeshadows. And so far I am happy with the results. Although the shades are quite durable, I wouldn't say they would last for 24 hours. Overall this is a lovely product which gives your eyes a natural shimmer. Essence's Winter Wonderland Eye & Inner Rim Liner was an impulse buy and although I don't usually go for Essence products I was fairly impressed with this liner. This liner comes in two shades, I purchased the shade Cold As Eyes. I don't use it very day but when I'm looking for a little something to make my eyes pop, I run this liner along my water line and it helps make my eyes stand out a little more. If you know of any other great white inner liners, let me know, I would love to hear from you. Last but not least is this pretty Brow This Way Highlighting Pencil by Rimmel - I have to admit that I really purchased this pencil because it looked so pretty and pink! I bought the shade 001 MATTE. It's a lovely pearly pink, the texture of the pencil is creamy but quite firm. I run it along under my brows to give me definition and a little highlight. It gives off a subtle shimmer highlight. I purchased mine at the local Clicks, but you can also buy it online from place like Zando. All these products combined give your face a subtle but lovely natural glow. All of them are cost effective and easy to apply. They're also the perfect products for someone not so sure on where to start or how achieve that glowy look. Hi, I'm Sarah Jeanne - welcome to my little space on the web!